Cbox Review 2019: Is Cbox a Good Hosting? 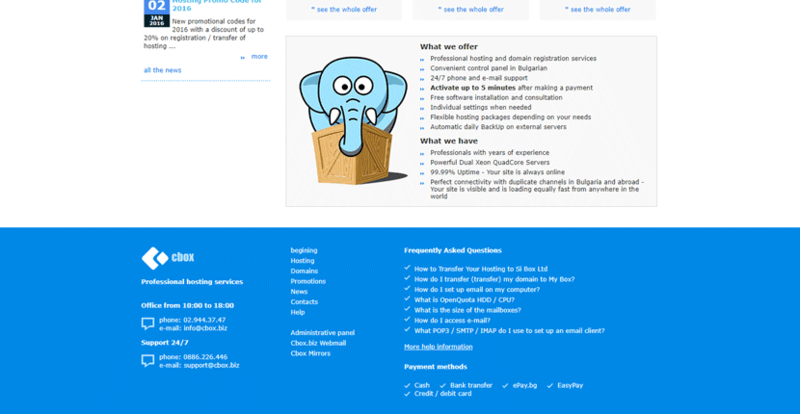 Cbox is a Bulgarian web hosting company that mainly serves their local market. They feature three shared hosting packages with 99.99% uptime. Cbox, a shared hosting service provider based in Bulgaria, offers services not just in their own country but also in other countries around the world, including Poland, Italy, Argentina, and India. Their website is only available in Bulgarian at the moment. Cbox only has three shared hosting packages on offer, but these are packed with loads of value. Each of them support multiple add-on domains and give you a 99.99% uptime guarantee. You also get loads of space, unlimited bandwidth, a free domain registration, and e-commerce support, which is likely why the small shared hosting provider’s reach has extended beyond the borders of their home country despite their service only being available in Bulgarian. With each of their three shared hosting packages, Cbox offers a convenient and simple control panel that makes managing your website and resources easy. Plus, even though installing software from the control panel is quite easy, you can even ask their technical staff to install software for you. Note, however, that their control panel is entirely in Bulgarian, so you’ll need a translator handy if you’re a foreign customer. The servers at Cbox are powered by Intel Dual Xeon QuadCore processors. Their high-quality infrastructure and connectivity with duplicate channels are instrumental in ensuring great uptime for your websites. Daily automatic backups stored on an external server further add to the safety of your website data. Of course, let’s not forget the all-essential SSL certificate, which Cbox provides for all their web hosting customers. You also get access to a webmail client, statistics to monitor the performance of your website, and FTP access. Their hosting has been divided into three different plans. In the Standard package, you’ll get 30GB disk space, up to five domains per account, ten databases, and 50 email addresses. This increases to 120GB storage, up to 20 hosted domains, 25 databases, and 150 email accounts in the Business package. Then comes the Pro package, which gives you 480GB space, up to 40 domains, and unlimited email accounts. All packages include unlimited bandwidth and a free domain registration. If you consider the storage space and bandwidth offered, you’ll realize that their hosting packages are by no means expensive. You can even save more money by paying up front for a longer contract. Cbox doesn’t offer any live chat support, but you can reach their sales office during regular working hours by email and telephone. Customer support is available 24/7, also by email and telephone. Unfortunately, their help section currently redirects to a webpage similar to their homepage, which is a worry. There’s also a FAQ, but it only answers a few basic questions. Cbox’s packages are adequate for almost all kinds of website owners looking for reliable shared hosting. Lack of unlimited storage may bother some users but for most, the given allocations are far more than enough. Their limited support channels are disappointing, but that shouldn’t stop you from making good use of their other features. Wondering how Cbox stacks up against other Web Hosting companies? Enter any other Web Hosting company and we will give you a side-by-side comparison.